Below are some definitions of fermentation. They range from informal, general usages to more scientific definitions. Any metabolic process that releases energy from a sugar or other organic molecule, does not require oxygen or an electron transport system, and uses an organic molecule as the final electron acceptor (most scientific). Along with photosynthesis and aerobic respiration, fermentation is a way of extracting energy from molecules, but it is the only one common to all bacteria and eukaryotes. It is therefore considered the oldest metabolic pathway, suitable for an environment that does not yet have oxygen. :389 Yeast, a form of fungus, occurs in almost any environment capable of supporting microbes, from the skins of fruits to the guts of insects and mammals and the deep ocean, and they harvest sugar-rich materials to produce ethanol and carbon dioxide. Fermentative bacteria play an essential role in the production of methane in habitats ranging from the rumens of cattle to sewage digesters and freshwater sediments. They produce hydrogen, carbon dioxide, formate and acetate and carboxylic acids; and then consortia of microbes convert the carbon dioxide and acetate to methane. Acetogenic bacteria oxidize the acids, obtaining more acetate and either hydrogen or formate. Finally, methanogens (which are in the domain Archea) convert acetate to methane. Fermentation reacts NADH with an endogenous, organic electron acceptor. Usually this is pyruvate formed from sugar through glycolysis. The reaction produces NAD+ and an organic product, typical examples being ethanol, lactic acid, carbon dioxide, and hydrogen gas (H2). However, more exotic compounds can be produced by fermentation, such as butyric acid and acetone. Fermentation products contain chemical energy (they are not fully oxidized), but are considered waste products, since they cannot be metabolized further without the use of oxygen. Fermentation normally occurs in an anaerobic environment. In the presence of O2, NADH, and pyruvate are used to generate ATP in respiration. This is called oxidative phosphorylation, and it generates much more ATP than glycolysis alone. For that reason, fermentation is rarely utilized when oxygen is available. However, even in the presence of abundant oxygen, some strains of yeast such as Saccharomyces cerevisiae prefer fermentation to aerobic respiration as long as there is an adequate supply of sugars (a phenomenon known as the Crabtree effect). Some fermentation processes involve obligate anaerobes, which cannot tolerate oxygen. 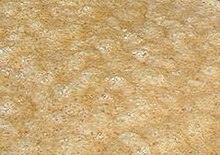 Although yeast carries out the fermentation in the production of ethanol in beers, wines, and other alcoholic drinks, this is not the only possible agent: bacteria carry out the fermentation in the production of xanthan gum. In ethanol fermentation, one glucose molecule is converted into two ethanol molecules and two carbon dioxide molecules. It is used to make bread dough rise: the carbon dioxide forms bubbles, expanding the dough into a foam. The ethanol is the intoxicating agent in alcoholic beverages such as wine, beer and liquor. Fermentation of feedstocks, including sugarcane, corn, and sugar beets, produces ethanol that is added to gasoline. In some species of fish, including goldfish and carp, it provides energy when oxygen is scarce (along with lactic acid fermentation). The figure illustrates the process. Before fermentation, a glucose molecule breaks down into two pyruvate molecules. The energy from this exothermic reaction is used to bind inorganic phosphates to ATP and convert NAD+ to NADH. The pyruvates break down into two acetaldehyde molecules and give off two carbon dioxide molecules as a waste product. The acetaldehyde is reduced into ethanol using the energy and hydrogen from NADH, and the NADH is oxidized into NAD+ so that the cycle may repeat. The reaction is catalysed by the enzymes pyruvate decarboxylase and alcohol dehydrogenase. The acidity of lactic acid impedes biological processes. This can be beneficial to the fermenting organism as it drives out competitors that are unadapted to the acidity. As a result, the food will have a longer shelf life (part of the reason foods are purposely fermented in the first place); however, beyond a certain point, the acidity starts affecting the organism that produces it. The high concentration of lactic acid (the final product of fermentation) drives the equilibrium backwards (Le Chatelier's principle), decreasing the rate at which fermentation can occur and slowing down growth. Ethanol, into which lactic acid can be easily converted, is volatile and will readily escape, allowing the reaction to proceed easily. CO2 is also produced, but it is only weakly acidic and even more volatile than ethanol. Acetic acid (another conversion product) is acidic and not as volatile as ethanol; however, in the presence of limited oxygen, its creation from lactic acid releases additional energy. It is a lighter molecule than lactic acid, that forms fewer hydrogen bonds with its surroundings (due to having fewer groups that can form such bonds), thus is more volatile and will also allow the reaction to move forward more quickly. Hydrogen gas is produced in many types of fermentation (mixed acid fermentation, butyric acid fermentation, caproate fermentation, butanol fermentation, glyoxylate fermentation) as a way to regenerate NAD+ from NADH. Electrons are transferred to ferredoxin, which in turn is oxidized by hydrogenase, producing H2. Hydrogen gas is a substrate for methanogens and sulfate reducers, which keep the concentration of hydrogen low and favor the production of such an energy-rich compound, but hydrogen gas at a fairly high concentration can nevertheless be formed, as in flatus. Most industrial fermentation uses batch or fed-batch procedures, although continuous fermentation can be more economical if various challenges, particularly the difficulty of maintaining sterility, can be met. The high cost of sterilizing the fermentor between batches can be avoided using various open fermentation approaches that are able to resist contamination. One is to use a naturally evolved mixed culture. This is particularly favored in wastewater treatment, since mixed populations can adapt to a wide variety of wastes. Thermophilic bacteria can produce lactic acid at temperatures of around 50 degrees Celsius, sufficient to discourage microbial contamination; and ethanol has been produced at a temperature of 70 °C. This is just below its boiling point (78 °C), making it easy to extract. Halophilic bacteria can produce bioplastics in hypersaline conditions. Solid-state fermentation adds a small amount of water to a solid substrate; it is widely used in the food industry to produce flavors, enzymes and organic acids. In continuous fermentation, substrates are added and final products removed continuously. There are three varieties: chemostats, which hold nutrient levels constant; turbidostats, which keep cell mass constant; and plug flow reactors in which the culture medium flows steadily through a tube while the cells are recycled from the outlet to the inlet. If the process works well, there is a steady flow of feed and effluent and the costs of repeatedly setting up a batch are avoided. Also, it can prolong the exponential growth phase and avoid byproducts that inhibit the reactions by continuously removing them. However, it is difficult to maintain a steady state and avoid contamination, and the design tends to be complex. Typically the fermentor must run for over 500 hours to be more economical than batch processors. The turning point came when Louis Pasteur (1822–1895), during the 1850s and 1860s, repeated Schwann's experiments and showed that fermentation is initiated by living organisms in a series of investigations. :6 In 1857, Pasteur showed that lactic acid fermentation is caused by living organisms. In 1860, he demonstrated that bacteria cause souring in milk, a process formerly thought to be merely a chemical change, and his work in identifying the role of microorganisms in food spoilage led to the process of pasteurization. In 1877, working to improve the French brewing industry, Pasteur published his famous paper on fermentation, "Etudes sur la Bière", which was translated into English in 1879 as "Studies on fermentation". He defined fermentation (incorrectly) as "Life without air", but correctly showed that specific types of microorganisms cause specific types of fermentations and specific end-products. Advances in microbiology and fermentation technology have continued steadily up until the present. For example, in the 1930s, it was discovered that microorganisms could be mutated with physical and chemical treatments to be higher-yielding, faster-growing, tolerant of less oxygen, and able to use a more concentrated medium. Strain selection and hybridization developed as well, affecting most modern food fermentations. Wikisource has the text of the 1911 Encyclopædia Britannica article Fermentation. ^ Hui, Y. H. (2004). Handbook of vegetable preservation and processing. New York: M. Dekker. p. 180. ISBN 978-0-8247-4301-7. OCLC 52942889. ^ a b Klein, Donald W.; Lansing M.; Harley, John (2006). Microbiology (6th ed.). New York: McGraw-Hill. ISBN 978-0-07-255678-0. ^ Bowen, Richard. "Microbial Fermentation". Hypertexts for biological sciences. Colorado State University. Retrieved 29 April 2018. ^ Tortora, Gerard J.; Funke, Berdell R.; Case, Christine L. (2010). "5". Microbiology An Introduction (10 ed.). San Francisco, CA 94111, USA: Pearson Benjamin Cummings. p. 135. ISBN 978-0-321-58202-7. ^ a b Tobin, Allan; Dusheck, Jennie (2005). Asking about life (3rd ed.). Pacific Grove, Calif.: Brooks/Cole. ISBN 9780534406530. ^ Martini, A. (1992). "Biodiversity and conservation of yeasts". Biodiversity and Conservation. 1 (4): 324–333. doi:10.1007/BF00693768. ^ Bass, D.; Howe, A.; Brown, N.; Barton, H.; Demidova, M.; Michelle, H.; Li, L.; Sanders, H.; Watkinson, S. C; Willcock, S.; Richards, T. A (22 December 2007). "Yeast forms dominate fungal diversity in the deep oceans". Proceedings of the Royal Society B: Biological Sciences. 274 (1629): 3069–3077. doi:10.1098/rspb.2007.1067. PMC 2293941. PMID 17939990. ^ Voet, Donald; Voet, Judith G. (2010). Biochemistry (4th ed.). Wiley Global Education. ISBN 9781118139936. ^ Broda, E (2014). The Evolution of the Bioenergetic Processes. Elsevier. ISBN 9781483136134. ^ Ferry, J G (September 1992). "Methane from acetate". Journal of Bacteriology. 174 (17): 5489–5495. doi:10.1128/jb.174.17.5489-5495.1992. PMC 206491. PMID 1512186. ^ Stryer, Lubert (1995). Biochemistry (fourth ed.). New York - Basingstoke: W. H. Freeman and Company. ISBN 978-0716720096. ^ Piškur, Jure; Compagno, Concetta (2014). Molecular mechanisms in yeast carbon metabolism. Springer. p. 12. ISBN 9783642550133. ^ a b c Purves, William K.; Sadava, David E.; Orians, Gordon H.; Heller, H. Craig (2003). Life, the science of biology (7th ed.). Sunderland, Mass. : Sinauer Associates. pp. 139–140. ISBN 978-0-7167-9856-9. ^ Stryer, Lubert (1975). Biochemistry. W. H. Freeman and Company. ISBN 978-0-7167-0174-3. ^ Logan, BK; Distefano, S (1997). "Ethanol content of various foods and soft drinks and their potential for interference with a breath-alcohol test". Journal of Analytical Toxicology. 22 (3): 181–3. doi:10.1093/jat/22.3.181. PMID 9602932. ^ "The Alcohol Content of Bread". Canadian Medical Association Journal. 16 (11): 1394–5. November 1926. PMC 1709087. PMID 20316063. ^ "Alcohol". Drugs.com. Retrieved 26 April 2018. ^ James Jacobs, Ag Economist. "Ethanol from Sugar". United States Department of Agriculture. Archived from the original on 2007-09-10. Retrieved 2007-09-04. ^ van Waarde, Aren; Thillart, G. Van den; Verhagen, Maria (1993). "Ethanol Formation and pH-Regulation in Fish". Surviving Hypoxia. pp. 157−170. ISBN 978-0-8493-4226-4. ^ Madigan, Michael T.; Martinko, John M.; Parker, Jack (1996). Brock biology of microorganisms (8th ed.). Prentice Hall. ISBN 978-0-13-520875-5. ^ Thauer, R.K.; Jungermann, K.; Decker, K. (1977). "Energy conservation in chemotrophic anaerobic bacteria". Bacteriological Reviews. 41 (1): 100–80. ISSN 0005-3678. PMC 413997. PMID 860983. ^ a b c d e Li, Teng; Chen, Xiang-bin; Chen, Jin-chun; Wu, Qiong; Chen, Guo-Qiang (December 2014). "Open and continuous fermentation: Products, conditions and bioprocess economy". Biotechnology Journal. 9 (12): 1503–1511. doi:10.1002/biot.201400084. PMID 25476917. ^ a b c d Cinar, Ali; Parulekar, Satish J.; Undey, Cenk; Birol, Gulnur (2003). Batch fermentation modeling, monitoring, and control. New York: Marcel Dekker. ISBN 9780203911358. ^ a b c Schmid, Rolf D.; Schmidt-Dannert, Claudia (2016). Biotechnology : an illustrated primer (Second ed.). John Wiley & Sons. p. 92. ISBN 9783527335152. ^ Vouillamoz, J. F.; McGovern, P. E.; Ergul, A.; Söylemezoğlu, G. K.; Tevzadze, G.; Meredith, C. P.; Grando, M. S. (2006). "Genetic characterization and relationships of traditional grape cultivars from Transcaucasia and Anatolia". Plant Genetic Resources: Characterization and Utilization. 4 (2): 144. CiteSeerX 10.1.1.611.7102. doi:10.1079/PGR2006114. ^ Cavalieri, D; McGovern P.E. ; Hartl D.L. ; Mortimer R.; Polsinelli M. (2003). "Evidence for S. cerevisiae fermentation in ancient wine" (PDF). Journal of Molecular Evolution. 57 Suppl 1: S226–32. CiteSeerX 10.1.1.628.6396. doi:10.1007/s00239-003-0031-2. PMID 15008419. 15008419. Archived from the original (PDF) on December 9, 2006. Retrieved 2007-01-28. ^ "Gintaras Beresneviius. M. Strijkovskio Kronikos" lietuvi diev sraas". spauda.lt. ^ Rūgutis. Mitologijos enciklopedija, 2 tomas. Vilnius. Vaga. 1999. 293 p.
^ Shurtleff, William; Aoyagi, Akiko. "A Brief History of Fermentation, East and West". Soyinfo Center. Soyfoods Center, Lafayette, California. Retrieved 30 April 2018. ^ a b Lengeler, Joseph W.; Drews, Gerhart; Schlegel, Hans Günter, eds. (1999). Biology of the prokaryotes. Stuttgart: Thieme [u.a.] ISBN 9783131084118. ^ Accomplishments of Louis Pasteur Archived 2010-11-30 at the Wayback Machine. Fjcollazo.com (2005-12-30). Retrieved on 2011-01-04. ^ HowStuffWorks "Louis Pasteur". Science.howstuffworks.com (2009-07-01). Retrieved on 2011-01-04. ^ Louis Pasteur (1879) Studies on fermentation: The diseases of beer, their causes, and the means of preventing them. Macmillan Publishers. ^ a b Modern History Sourcebook: Louis Pasteur (1822–1895): Physiological theory of fermentation, 1879. Translated by F. Faulkner, D.C. Robb. ^ New beer in an old bottle: Eduard Buchner and the Growth of Biochemical Knowledge. Cornish-Bowden, Athel. Universitat de Valencia. 1997. ISBN 978-84-370-3328-0. p. 25. ^ The enigma of ferment: from the philosopher's stone to the first biochemical Nobel prize. Lagerkvist, Ulf. World Scientific Publishers. 2005. ISBN 978-981-256-421-4. p. 7. ^ A treasury of world science, Volume 1962, Part 1. Runes, Dagobert David. Philosophical Library Publishers. 1962. p. 109. ^ Steinkraus, Keith (2018). Handbook of Indigenous Fermented Foods (Second ed.). CRC Press. ISBN 9781351442510. ^ Wang, H. L.; Swain, E. W.; Hesseltine, C. W. (1980). "Phytase of molds used in oriental food fermentation". Journal of Food Science. 45 (5): 1262. doi:10.1111/j.1365-2621.1980.tb06534.x.